"Papers Page" is built up from two basic google spreadsheets, "Papers Master" and "Papers Subjects". "Papers Master" contains descriptions about papers, such as, pubmed ID, authors, citation, et al.. Papers are affiliated to some grants. Grants information is stored in "Papers Subjects". You should always include the PMID if a paper is known to be listed in PubMed. Option 2 should be used for papers that are in press. The other group of tags supplies additional information about the paper specified by the first group of tags. All of these tags are optional, however used of <subjects> and <preprint> is strongly encouraged. We encourage you to sort <category> after adding new grants because of coding issues. <website> should also be reflected in <html> section. For example, "don" has <website> "http://www.donaghue.org", also "URL: <A HREF=http://www.donaghue.org> http://www.donaghue.org</A>" in <html> section. Download XML file from NCBI using PubMed ID to generate pubmed_spreadsheet. Pubmed_spreadsheet stores <title> <citation> et al. 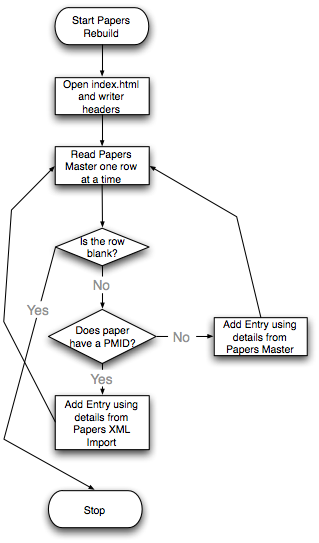 of papers corresponding to "PMID" in "Papers Master". This step is done by scripts automatically. This step grabs all information from three spreadsheets, "Papers Master","Papers Subjects" and "Pubmed_Spreadsheet", to build up the whole website. Each paper and each grant has its own description page.